Tax Planning for Family Wealth Transfers During Life: Analysis With Forms (5th Edition) examines the many techniques for reducing a family's total tax liability and preserving its total wealth over time. With this treatise, practitioners can better understand complicated IRS rulings and are better able select the right type of transfer for their clients. Subsidiary topics include reversionary trusts, grantor retained annuity trusts, split purchase of a residence, corporate and partnership freezes, gifts to minors, gifts under a durable power of attorney and more. The results are greater wealth preservation and minimum tax liability for current and future generations of your client's family. Discussions include: saving for a child's education, caring for elderly parents with pre-tax dollars, transferring the growth of a business to children without surrendering control, gift-giving without consequences, and handling highly appreciated stocks and bonds. 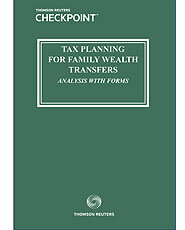 Tax Planning for Family Wealth Transfers During Life: Analysis with Forms is the perfect companion to Howard Zaritsky’s Tax Planning for Family Wealth Transfers At Death: Analysis With Forms.